Drostan Hall, Music Director, and founder of Camerata Chicago, is a graduate of the Royal Northern College of Music in Manchester, England where he studied violin with Yossi Zivoni and Northern Illinois University where he studied with members of the Vermeer String Quartet including Shmuel Ashkenasi, Piere Menard and Mathias Tacke. Drostan began violin lessons at the age of 4 and at the age of 12 he received a Martin Musical Scholarship to continue his studies with Frederick Grinke. A year later he was selected to compete in the first Yehudi Menuhin International Violin Competition. The Aldeburgh Foundation invited Drostan to participate in their internationally acclaimed master classes at the Britten-Pears School for Advanced Musical Studies where he studied with Ruggiero Ricci and Norbert Brianin. Drostan, at the age of 14, was the youngest ever violinist to participate in these master classes. In 1995 Drostan toured Germany with the Internationale Junge Orchestraakadamie performing the Bruch Violin Concerto. Drostan collaborated with pianist Lyudmila Lakisova giving many acclaimed recitals in Chicago and received invitations to give live radio broadcasts for Chicago’s WFMT radio station and in 2003 toured the U.K. In 2001 he produced Ferdinand & Friends an educational compact disc for children on the DMD Classics label which became a best seller in various educational catalogues. Drostan came to the podium in 2003 when he was invited to conduct Handel’s Messiah at a local Chicago church. While studying the score of this sacred work he decided to found Camerata Chicago. Since then, as Music Director of Camerata Chicago, has collaborated with distinguished artists such as, Wendy Warner, Peter Van De Graaf, the International Beethoven Project Trio and Michelle Arezaga. Drostan has had a particularly close relationship with the internationally acclaimed Vermeer String Quartet, collaborating with the quartet’s leader Shmuel Ashkenasi with whom he performed and recorded the 5th violin concerto of Mozart. Mr. Ashkenasi subsequently became Artistic Advisor to Camerata Chicago in 2006. In 2008 Drostan was pleased to appoint Mathias Tacke, second violinist of the quartet to the concertmaster chair and since then has recorded well known Bach violin Concerti with him . Cellist Marc Johnson soloed with Drostan in 2008. 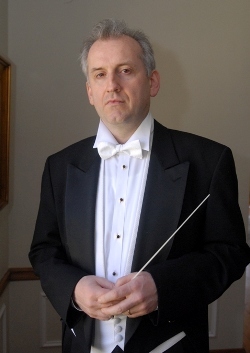 In the US Drostan has conducted at well known festivals such as the Utah Music Festival and the Woodstock Mozart Festival and in December 2011 will guest conduct the LaCrosse Symphony Orchestra, WI. His work with Camerata Chicago has been very fruitful including numerous live radio broadcasts on Chicago’s radio station WFMT and compact disc releases on the Centaur and DMD classics labels. As music Director of Camerata Chicago he has appeared at the Art Institute of Chicago, The Harris Theater, Chicago Cultural Center, Northeastern Illinois University, North Park University, College Church, and St. Michael’s Catholic Church, Wheaton. Drostan collaborated with Michelle Areyzaga conducting the world premiere of Tenderness Songs by Gwyneth Walker. In the upcoming season he will collaborate with Internationally renowned violinist Susanne Hou and pianist George Lepauw of the Beethoven Project Trio. In addition to his work with Camerata Chicago, Drostan is Music Director of The Baroque Festival Orchestra, a youth orchestra at the Hall School of Music. Drostan and Camerata Chicago with Wendy Warner as soloist will undertake a major European tour to include numerous capital cities. "Drostan Hall is clearly first class and conducts with tremendous energy and musical sensitivity." "Drostan Hall is a very gifted conductor and I found him to be one of the best accompanists I have ever worked with. In addition to his obvious skills at directing and inspiring the orchestra to play with great musical sensitivity, he is also able to produce a very high degree of precision in ensemble and technical execution.